Dr. Jean Lomino has worked with over 80 teachers from throughout the US and abroad over the past four years. She is uniquely qualified for this task with almost 50 years experience in education as a classroom teacher, environmental/outdoor educator, nature center director, university adjunct professor, teacher trainer and consultant. 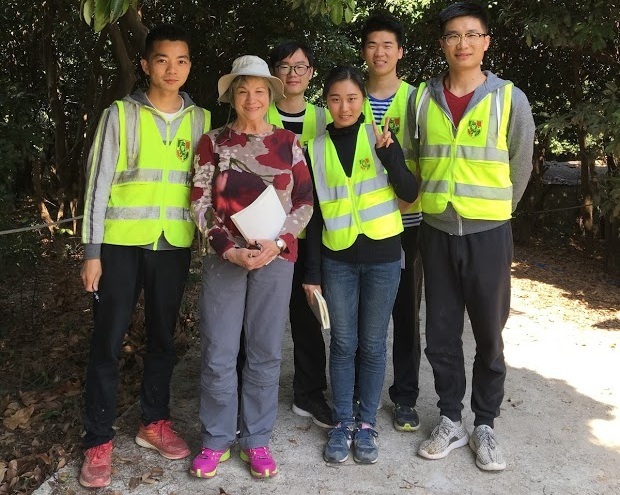 In 2017 she spent two months in Guangzhou, China as a Forest Kindergarten consultant and teacher trainer and returned with many new insights and a greater sense of purpose to help build this global movement. Seven teachers traveled to Wauhatchie School from Jinang, China in 2018 to spend two weeks with Jean for a study tour and in-depth training, and that same summer a teacher from Cape Town, South Africa trained for a month at Wauhatchie School. Jean is also conducting research with Dr. Jiyoun Shin, Vice-Chair of the Korean Forest Kindergarten Association in Seoul, South Korea. They are writing a guidebook for Forest Schools that will include the results of their research into character strength development in Forest Kindergarten. This two-day session (6 hrs. per day) provides 6 hours of direct observation at Wauhatchie Forest Kindergarten and 6 hours of class discussion, debrief and naturalist training. The fee is $500 per person. Each session is limited to five participants. The session is designed to provide an introductory experience for teaching in a Forest Kindergarten setting. After the 12-hour training is concluded, each participant will receive an Introduction to Forest Kindergarten Certificate of Completion. Fee includes all class materials. For more details and to apply go to www.forestteacher.org. This session includes four full days (8 hrs. per day): 12 hours of direct observation and teaching practice at Wauhatchie Forest Kindergarten's main Reflection Riding Arboretum & Nature Center site and at satellite sites, 12 hours of class discussion and 8 hours of nature training provided by a professional naturalist. The session is limited to 5 participants and is designed to provide more in depth understanding of teaching philosophy and strategies, beginning naturalist skills, plus hands-on teaching practice. This training will prepare a trainee to be a beginning teacher in a Forest Kindergarten setting. The cost for this 32-hour session is $1000. After the training is concluded, each participant will receive a Level 1 Forest Kindergarten Teacher Certificate of Completion. Fee includes all class materials. For more details and to apply go to www.forestteacher.org. For more details and to apply go to www.forestteacher.org. Individualized sessions can take place at the participant’s Forest Kindergarten site. Dr. Lomino and/or other members of her consulting team will contract with the school to provide help with the following: fundamentals of non-profit management, site development, business planning, staffing, parent communication and marketing, and other topics as determined by the school and consultant team. The goal for this service is to help the participant/school complete necessary preliminary work including proposal writing, donor recruitment and business plan to establish a Forest Kindergarten or Forest School. Additional services may include: follow-up consultations for six months, resource guides, curriculum development and other reference materials. (Transportation and lodging are additional costs.) For more details and to apply go to www.forestteacher.org. Forest Kindergartens are spreading rapidly throughout the South. Since 2015 Dr. Lomino has trained over 80 teachers from across the region, many of whom have gone back to their schools to implement Forest School philosophy in established programs, and others have established their own stand-alone programs. This new study tour will include first hand visits to several of these schools within a 200-mile radius of Chattanooga, TN. For more details and to apply go to www.forestteacher.org. Matt Harris, Director of Innovation, Walker County Schools, Lafayette, GA.
Amina Hoosain, Founder and Director of Blooming Good Nature School, Cape Town, South Africa.